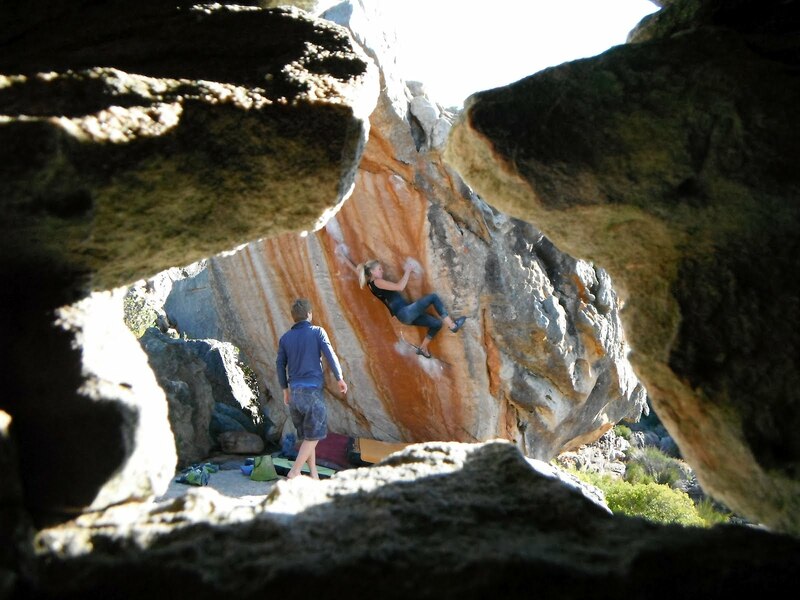 I took a trip to the southern hemisphere to check out the climbing in South Africa at the world class Rocklands. The quality of the boulder problems here is on par with Hueco Tanks. 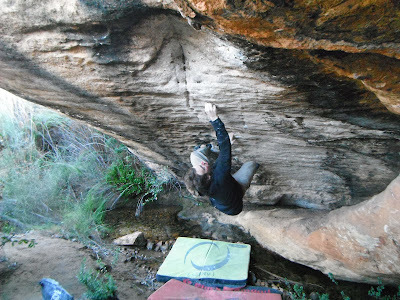 There is potential for more boulder problems than Hueco when this place has become more developed. The different areas are spread out over a larger geographic area. 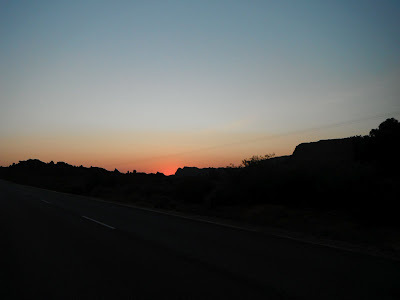 The accommodations down here are by far better than Hueco Tanks whether it be camping or staying in a cottage. The only downside is that the weather is not as good as Hueco. It tends to rain a fair amount in the Rocklands followed by heat and/or mist, then occasionally there will be a day of perfect conditions in which it becomes cold, dry, and windy. The mean temperature is approximately 15 degrees Fahrenheit warmer than Hueco when it is in season. The Rocklands proper or the pass is what most people think of when Rocklands comes to mind. It is by far one of the sectors concentrated with areas that are littered with classic boulder problems of all difficulties. The sandstone here is impressive. It yields more steep boulder problems than the sandstone found in the western states such as in Joe's Valley and other areas. There were other areas other than the Rockland's proper and the de Pakhuy's campground. There were a few areas down the road by Traveller's rest including the Sassies and 8 day rain. These sectors were at lower elevation and seemed to dry more quickly than the pass. Further towards town were areas such as the old Kliphuis campground, Champsite, Riverside, and the Tea Garden. Riverside is one of my favorite sectors in Rocklands. It is a short hike to the boulders from the car, and the warm-ups are great. The area is scenic, and has a cool water drainage system. The rock in this zone is immaculate, and yields climbs of all difficulties. I got video of two moderates in this zone: Baboon Roof and Les Pieds Dans L'eau. I managed to climb a cool roof in this zone called White Mazda Clan. Unfortunately I tweaked a pulley on this climb which ended my trip early. The Wailing Wall was a fun moderate wall that was slightly overhung, and then kicked back to a slabby finish at the top. The quality of rock on this wall was bomber, and the holds were dope. The Tea Garden was a fun sector close to town, and literally right on the side of the road. The Tea Garden Roof is a long classic roof climb that I finished with double toe hooks to the lip. I began projecting Black Shadow on this trip which is an Ultra-classic. The climbing is fun, sustained, and intense. This climb is easily one of the best in the world. 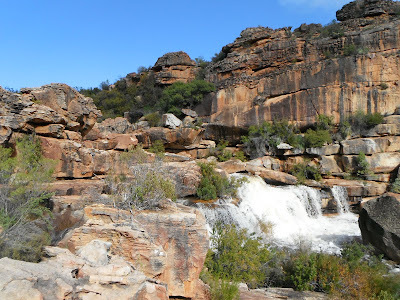 I stayed at the de Pakhuy's campground during my stint in the Rocklands. The de Pakhuy's campground blows the camping in Hueco out of the water. There is actually water and electricity in the campsite. There is an area for cooking, and the showers are spacious and clean. The back wall of the showers is actually a boulder the building was constructed around. There is a bar at the campground, as well as pizza night twice per week. People in South Africa eat a lot of meat, and do frequent Bries, which is basically the equivalent to a BBQ. The downside is that there is not a great place to hang out during rainstorms. There was a fair amount of climbing accessible from the de Pakhuy's campground. The Fields of Joy, Plateau, Dihedral Boulders, Campground Boulders, and Arch Valley were all a short walk from the camping. I enjoyed the experience of being submerged into another culture. The area the Rocklands is located in is farm country. de Pakhuy's farm grew amazing olives, grapes for wine, and Rooibos tea. South Africa is the only location in the world in which Rooibos tea grows. It is a naturally decaffeinated plant that brews a tasty beverage. Other crops grown in the local area were oranges and grenadillas (passion fruit). This was my first overseas trip out of the United States. It was cool to see the little differences between South Africa and the States. The metric system is an obvious difference down south. I still have yet to comprehend why the United States feels arrogant enough to demand their own measurement system. I use the metric system in the medical field, and I end up doing conversions constantly. Another difference is the vehicles and traffic. Traffic is driven on the left side of the road, and the driver's side of the car is on the right side of the vehicle. The plants and animals in South Africa were drastically different than in the Northern hemisphere. It was not an odd occurrence to see baboons in the campground. Outlets in this country are three prong instead of two. The currency is another obvious difference, which is Rands in South Africa. The first four videos are of classic moderates in the Road Crew sector. The last two videos are from the Riverside area. Enjoy! Au Bord De L'eau, Riverside. Sunset from Champsite. Vanessa on Ulan Bator, Road Crew. 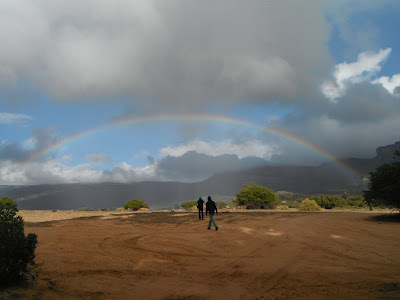 View of a rainbow spanning the pass from de Pakhuy's campground. Waterfall after a rain storm.